Princess Pansy received a Black Label Vintage Double Diner. We love the antique/vintage look. Doesn't it look great! We really like the double diners because there is less of a chance of spilling it then there is with just a single dish. Here is a little bit about our Double Diner... "Durable Vintage Double Diners add a touch of vintage style to any decor. Antique finishes are applied to galvanized steel bases which hold our Ruff N’ Tuff veterinarian recommended stainless steel bowl inserts. Embossed pawprints add depth and dimension to the design. The stainless steel bowl inserts are removable for easy cleaning. Both the bowls and the base are dishwasher safe. A skid free removable rubber base prevents slipping, sliding and spilling." The Dishes are just the right size! 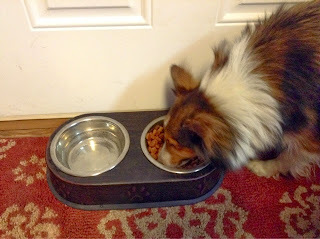 Pansy is the only one of our dogs allowed to use this set, so the dishes are just the right size for her food and water for the day. The stainless steel dishes are removable so they are VERY easy to take out and fill with food/water or clean. 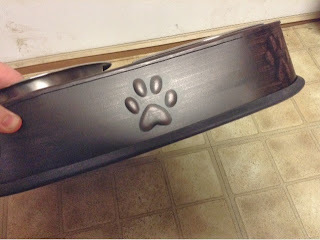 Love the embossed paw prints! You can view Double Diners or other awesome products on the Loving Pets Website. You can also Like them on Facebook and Follow them on Twitterto stay up to date with their latest news and products. 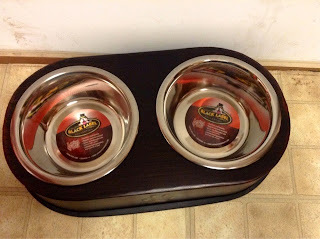 Loving Pets is a #1 Pet Product! I like the Black Label Aged Copper Rustic Bone Double Diner. I like the Pint Size Merlot one. My favorite is the Dolce Double Diners® – Paparazzi Pink. I like the Black Label Mission Elevated Double Diner! It's really fits the style of our house. My favorite is the Dolce Double Diners® – Murano Blue. 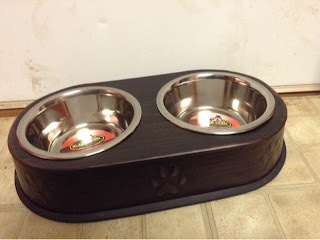 The bone shaped base is adorable and the color would look great with my kitchen decor.